Due to poor “tag counts” from the initial sequencing (DATE) and the re-sequencing (20131127) of this sample, the HTGU facility has concluded that the library is probably at fault. They will make a new library and do a quality control run on the new library. However, they have insufficient gDNA left to make a new library. 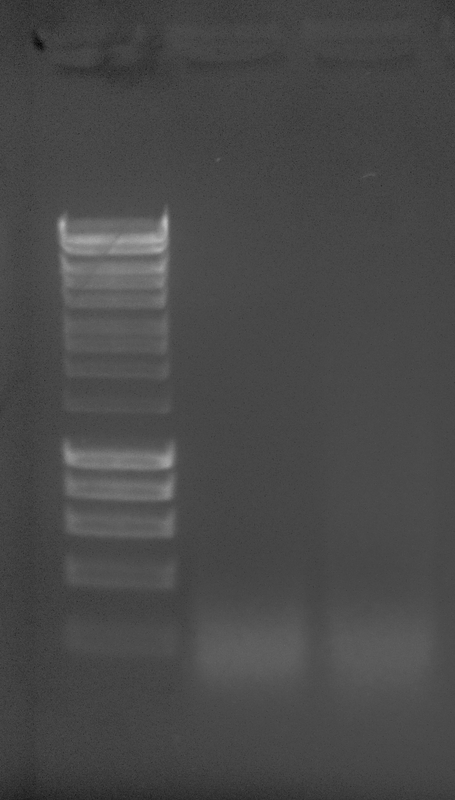 Isolated gDNA from Claire’s sample following the DNAzol protocol. Transferred ~300uL of female C.gigas gonad from the source tube (ethanol-preserved) to a clean tube. Pelleted gonadal material by spinning 10,000g, 30seconds, @ RT. Decanted residual ethanol. Resuspended tissue in 500uL of DNAzol + 100ug of Proteinase K (Fermentas; 18.5mg/mL). Incubated on a rotator for ~6hrs. Proceeded according to DNAzol protocol. Resuspended final pellet in 100uL of Elution Buffer (Qiagen; EB). After resuspension, pelleted remaining debris 16,000g, 30seconds, @ RT. Transferred supernatant to clean tube and quantified on NanoDrop 1000. Will bring tube to sequencing facility tomorrow morning. This entry was posted in Llineage-specific DNA methylation patterns in developing oysters and tagged BS-seq, Crassostrea gigas, DNA Isolation, DNazol, female, gonad, Pacific oyster on 11 December, 2014 by kubu4. Trying this sample again(!! ), but will now use TE for pellet resuspension to prevent sample degradation. Incubated sample RT on rotator in 500uL of DNazol + 2.7uL of Proteinase K (Fermentas; Stock 18.5mg/mL) for 5hrs. Added additional 500uL of DNazol, mixed gently and followed DNazol manufacturer’s protocol. Performed first pellet was with 70% DNazol/ 30% EtOH solution. Resuspended pellet in 200uL of TE and spec’d on NanoDrop1000. Yield is good. 260/280 value is good. 260/230 value is poor. Will run on gel to evaluate integrity. Loaded 10uL (~830ng) on 1.0% agarose 1x modified TAE gel stained with EtBr. Well, this certainly looks much better than previous preparations, in that there is an obvious high molecular weight band present (previously, this had been absent). The low molecular weight bands/smears are possibly RNA carryover and/or degraded DNA. Will discuss with Steven and then, most likely, bring downtown for Illumina sequencing. I’m not entirely sure what is happening here. Until very recently, there were almost never such egregious differences between the NanoDrop measurements and what they were measuring downtown at the sequencing facility. It seems as though they have changed the way they quantify samples (possibly using an Agilent Bioanalyzer instead of the Life Technologies Qubit fluorometer? ), but this doesn’t mean their measurements are incorrect. However, I’m starting to suspect that the reason the initial sequencing of this sample was due to an overestimation of the quantity of input DNA (since I believe they were still using the fluorometer back then). As such, it’s become clear that C.gigas gonad samples seem to yield poor quantities of gDNA, relative to the amount of input material. Additionally, there may be insufficient sample left to generate a useable quantity of gDNA to complete this resequencing effort. This entry was posted in Llineage-specific DNA methylation patterns in developing oysters and tagged BS-seq, Crassostrea gigas, DNA Isolation, DNA Quantification, DNazol, female, gDNA, gel, gonad, Pacific oyster on 25 April, 2014 by kubu4. Due to the recent poor quality gDNA that has been isolated from C.gigas gonad, I decided to do a quick test using TE for DNA pellet resuspension in hopes that old Buffer EB (Qiagen) or old nuclease-free H2O (Promega) are to blame for the apparent, rapid degradation that I’ve experienced. Incubated ~25mg of tissue O/N @ RT in 500uL of DNazol + 100ug/mL Proteniase K (2.7uL of 18.5mg/mL Fermentas stock) on rotator. Added additional 500uL of DNazol and briefly disrupted remaining tissue with a few pipette strokes. Pelleted debris by spinning 10mins, 10,000g @ RT. Transferred supe to new tube and repeated Steps 3 & 4 one time. Added 500uL of 100% EtOH; mixed by inversion. Pelleted DNA by spinning 5000g 5mins @ RT. Removed supe and washed pellet with 1mL of a 70% DNazol+30% EtOH solution. Removed supe and washed pellet with 1mL 70% EtOH. Repeated Step 8 two times. Discarded supe, quick spun tube to pool residual EtOH. Removed all residual EtOH. Resuspended in 200uL of TE (pH = 8.0) and incubated at RT for 5mins. Pelleted insoluble material 12,000g 10mins @ RT. Ran ~500ng on 1.0% agaroase 1x modified TAE gel to evaluate integrity. 260/280 value looks excellent, but, as always seems to be the case with DNazol/TriReagent, the 260/230 value looks crappy. Will investigate gDNA integrity on agarose gel. Well, look at that! A nice, clear, high molecular weight band! It looks like my Buffer EB and/or nuclease-free water are is contaminated. Have discarded both. Will re-isolated Claire and Mac’s gDNA. This entry was posted in Llineage-specific DNA methylation patterns in developing oysters, Miscellaneous and tagged Crassostrea gigas, DNA Isolation, DNazol, female, gel, gonad, Pacific oyster, troubleshooting on 16 April, 2014 by kubu4. Due to low 260/230 values and Mac’s smeary sample, performed a phenol-chloroform DNA cleanup on the samples isolated 20140410. Brought volume of each sample to 200uL with Buffer EB (Qiagen). Added an equal volume (200uL) of 25:24:1 Phenol/Chloroform:Isoamyl alcohol. Mixed on rotator for 20mins @ RT. Separated aqueous/organic phases by spinning at 12,000g 5mins @ RT. Transferred aqueous phase to new tube. Repeated steps 2-4 until samples exhibited no more interphase. Combined aqueous phases in to a single tube for each of the two samples. Added and equal volume of chloroform (170uL). Transferred aqueous phase to new tube. Performed an ethanol precipitation on each sample. Added 0.1 volumes of 5M sodium acetate (pH = 5.2). Added 2 volumes of ice cold 100% EtOH. Pelleted DNA by spinning 16,000g, 20mins @ 4C. Discarded supe and washed pellets with 1mL 70% EtOH. Pelleted DNA by spinning 16,000g, 5mins @ 4C. Repeated steps 5-6 one time. Removed all supernatant and resuspended in 100uL of nuclease-free H2O. So, the clean up seemed to work wonders on the 260/230 values. Not surprisingly, Mac’s sample didn’t clean up nearly as nicely as Claire’s, based on my observations of the odd behavior during EtOH precipitation. And, despite the nice, clean looking peaks, the 260/280 ratios are actually WORSE than the original isolation. Will run on gel for a further assessment of quality/integrity. Loaded 5uL of each sample (~600ng) on a 1.0% agarose, 1x modified TAE gel stained with ethidium bromide. 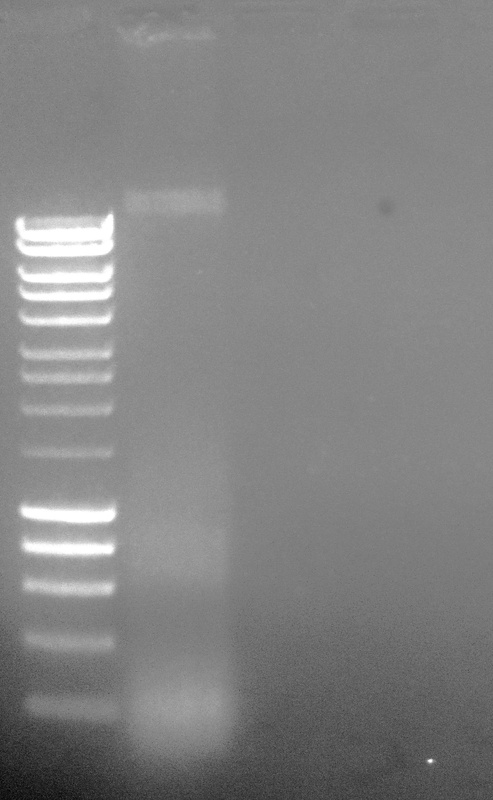 Used Hyperladder I this time, which has a high molecular weight band of 10kb and a low molecular weight band of 200bp. This entry was posted in Llineage-specific DNA methylation patterns in developing oysters and tagged Crassostrea gigas, DNA, DNA Quantification, female, gel, gonad, NanoDrop1000, Pacific oyster, phenol-chloroform cleanup, troubleshooting on 14 April, 2014 by kubu4. This entry was posted in Llineage-specific DNA methylation patterns in developing oysters and tagged Crassostrea gigas, DNA Isolation, DNA Quantification, DNazol, female, gDNA, gel, gonad, NanoDrop1000, Pacific oyster on 10 April, 2014 by kubu4. Ran out 2uL of Clair’es C.gigas female gonad gDNA (from 20140328) and Mac’s C.gigas gonad gDNA (from 20140402) for quality assessment. Both samples had been isolated using Qiagen’s Blood & Tissue DNeasy Kit. 2uL of each sample was run on a 0.8% 1x TBE gel. 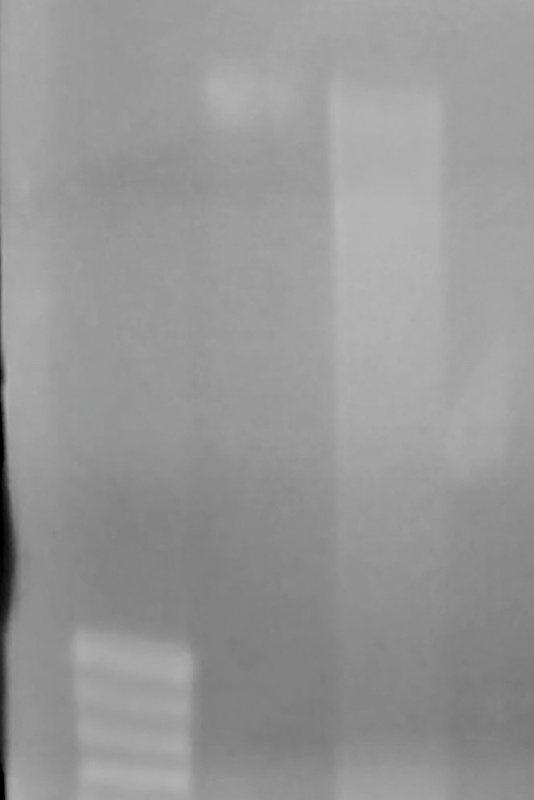 Both samples show an extremely high amount of smearing. Additionally, both samples have definitive bands that correspond to ~1300bp and ~850bp. This entry was posted in Llineage-specific DNA methylation patterns in developing oysters and tagged Crassostrea gigas, DNeasy, female, gDNA, gel, gonad, Pacific oyster on 4 April, 2014 by kubu4. Incubated sample in Buffer ATL + Proteinase K @ 56C for 3hrs. Vortexed once each hour. Eluted with 100uL of Buffer AE. Excellent yield and quality is good, although both the 260/280 and 260/230 ratios are on the high side. However, these high values could be an artifact of the high sample concentration (this is a common “issue” with the NanoDrop). This entry was posted in Llineage-specific DNA methylation patterns in developing oysters and tagged Crassostrea gigas, DNA Isolation, DNA Quantification, DNeasy, female, gonad, NanoDrop1000, Pacific oyster on 28 March, 2014 by kubu4.